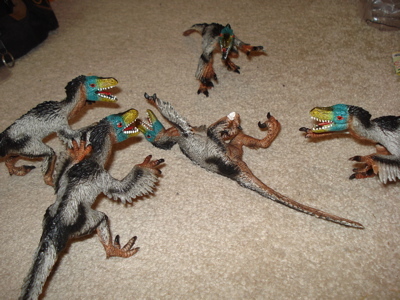 Theories of Dinosaurs extinction don't take Dinosaur toys seriously. Tomorrow you will all get to see, as the result of an ugly confrontation (above) a terrible injury resulted (below, left) and how our crack medical team (below, right) responded. (Above-Left) "Owwww!" (Right) "We've got it all under control." "Check it?? This'll raise it!! Help!" 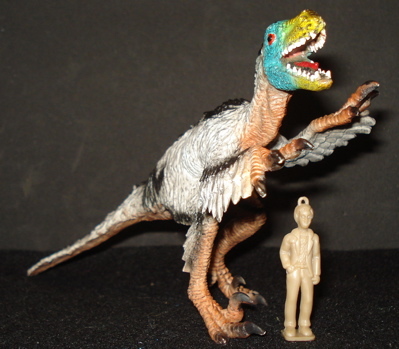 Feathered Dinosaur toys are relatively new members to the toy family. 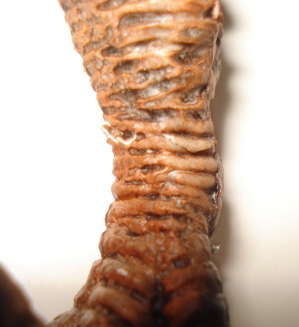 Recent theories based on fossilized impressions of feather-like coverings have led to several Dinosaur toys so dressed. 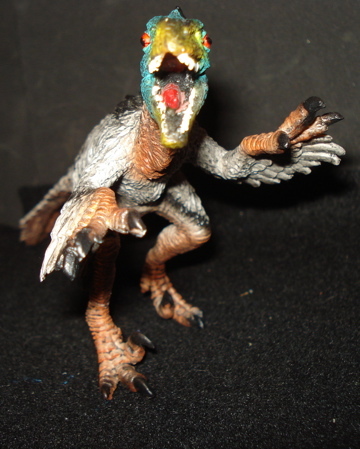 The Bullyland Velociraptor is one of those feathered-Dinosaur toys and has garnered quite a controversy about itself. Collectors argue and seem to either love it or hate it, most coming down in the latter camp. 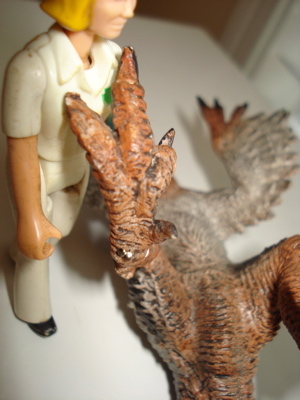 It comes in 1/20 scale and a proprietary comparatively softer rubber than most other lines of Dinosaur toys (Safari, The Carnegie Collection, PAPO, et al) which has its own benefits. 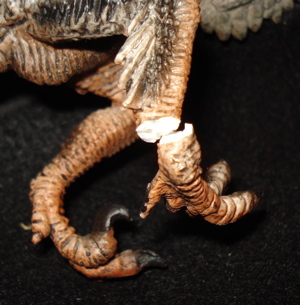 Much of the detail we have come to expect from contemporary, high-quality Dinosaur toys is covered with feathers (highly, well detailed feathers) in this figure and its pose is pretty melodramatic which, I think, has tended to put some people off. And of course there are those who just can't get behind the idea that Dinosaurs, any Dinosaurs, might have been covered in feathers as this guy is. In today's adventure a potentially tasty hunt (left) got cut short by a near catastrophic injury (below) to one of the hunters. 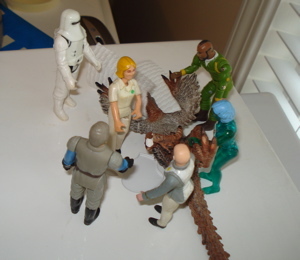 You can read all about it on today's Bullyland Velociraptor page and see the gastronomic tragedy that was averted. Tomorrow will be another day here in Dino-town, hope you'll join us again to find out what's happening. 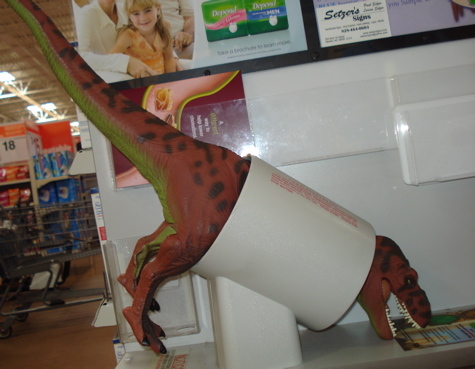 So you can readily see from the foregoing; had real Dinosaurs the medical care available to Dinosaur toys the entire Dinosaurs extinction could have been avoided. 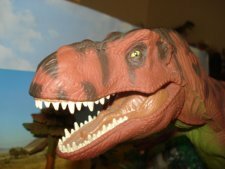 The Dinosaurs Extinction Avoidance blogs are part of our Dino-blog that you can access vis THIS link or you can return to the Blog Archive by clicking HERE.